Over the last few decades, several improvements have been made to dental care that allow you to preserve your teeth for longer than before. Despite these advancements, tooth loss is still an issue for many Americans. In fact, 120 million adults in the U.S. are missing at least one tooth while another 36 million do not have any remaining natural teeth. To replace them, you now have an alternative solution to traditional options, like dentures. With dental implants in Herndon, you can regain a complete smile with the next best thing to your own natural teeth. Dental implants have quickly become the preferred solution to treat tooth loss because they offer over a 95% success rate. As a result, more than 500,000 people every year are turning to them to fill the empty spaces in their smile. They not only replace the crown of the tooth but the root as well. This allows them to closely look and feel natural while offering the potential to remain in place forever. 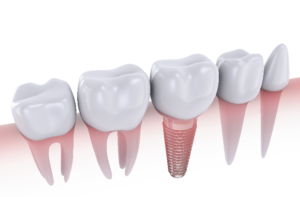 No matter if you are missing one tooth, multiple teeth, or all of them, dental implants can help. A single missing tooth can be treated using one dental implant post that is surgically placed into your jawbone. An abutment is then attached to connect a custom-made dental crown. If you are missing several teeth in a row, you can choose an alternative solution to a traditional bridge and crowns. Instead of using caps to hold the bridge of prosthetic teeth in place, an average of one to two implant posts will be used. Complete tooth loss can also be treated using dental implants. A custom-made denture will be held in place using implant posts. This provides a secure and stable foundation to stop slipping and irritation that is often associated with traditional dentures. If you have decreased bone density in your jaw, you can skip a bone grafting procedure with mini implants. They are smaller than traditional posts, allowing them to be used for those with compromised bone density. Now, you can replace an entire arch of missing teeth using 4 dental implant posts. When compared to traditional dentures, they offer an increased biting force of over 70%. You do not have to live with the challenges of tooth loss. You can restore your smile and your quality of life with a predictable and reliable solution. Contact your dentist to see if dental implants are right for you today. Dr. Farshad Bakhtyari not only earned his dental degree but also completed additional training in Fixed Prosthodontics and Endodontic Therapy. In addition, he has furthered his education in advanced areas of general dentistry. Due to his training and qualifications, he offers his patients the latest treatments and procedures, including dental implants. If you are ready to replace your missing teeth, schedule your consultation with Dr. Bakhtyair today.